Mickey Ouellette ’65 (right) stands with Sven Cole, Assistant Head of School during the medallion ceremony in honor of his 50th reunion. Jessica Priola, BA’s Director of Institutional Advancement, appears in the center background. Welcome to Bridgton Academy’s Alumni webpage—your portal to reconnecting with classmates and re-engaging with the greater Bridgton Academy community. Whether you graduated one year ago or seventy years ago, your association with Bridgton does not end with your commencement from this centuries-old Academy. You will always be a Wolverine—a member of The Black and the Grey; as such, your history with Bridgton is woven into the fabric of today’s Academy. As an alumnus, your present-day involvement with Bridgton Academy is the catalyst for an ever-evolving and stronger academic institution; one that builds upon its illustrious past in order to sustain the Academy of today and ensure that future generations of students can enjoy the same tradition of educational excellence in years to come. 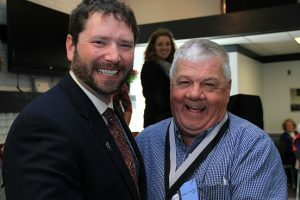 Let Bridgton Academy’s Office of Alumni & Development be the bridge that connects your Bridgton experience of yesterday with the life you enjoy today. How can I re-connect with my Bridgton classmates? Our office maintains the names, addresses, and related contact information for our entire alumni network—that means over 8,000 individuals! Alumni are encouraged to contact Sarah Gaines at sgaines@bridgtonacademy.org / (207) 647-3322 ext. 1213 to obtain a current listing* of your classmates and their contact information. *While we strive to keep all records as updated as possible, we sometimes simply do not have enough information to do so. If you find that your, or another classmate’s contact information is not accurate, please inform us so that we may adjust our records accordingly. Does the Academy host alumni events in my area? Bridgton Academy hosts a number of events throughout the year for alumni to enjoy, both on campus and throughout the New England region. We are currently looking to expand this, however, and anticipate hosting alumni events beyond greater New England*. Please see our calendar for an updated listing of future events. Make sure to check back frequently, as this calendar is updated regularly! *Don’t see your area listed? Let us know! We can help you connect with Bridgton alumni in your region and provide you with materials for hosting alumni events in your area. Homecoming Weekend is also a fantastic opportunity to reconnect with Bridgton Academy. Homecoming 2018 will take place September 28th – 30th. As an alumnus, how can I help my Academy? There are many ways in which you can lend a hand in support of Bridgton’s mission and vision. Our office offers an increasing number of volunteer opportunities that can showcase your strengths, while also helping your alma mater. Don’t see something that interests you? Let us know! We are eager to work with you to create a volunteer program that is mutually beneficial. I will be in the area. Can I stop by to see campus? Yes! Please do! You need not call in advance, but if you do, our office will be able to arrange for a tour guide who can help you access buildings and offer insight into the many updates your campus has seen over the last decade. Where can I find information on what my classmates and fellow Bridgton alumni have been up to since graduation? Alumni notes appear online twice a year, and are posted in parallel with the biannual publication of the print edition of the Academy’s newsletter, BA Today. To keep us “in the loop” with your exciting news, simply click the “Update Us” link, e-mail sgaines@bridgtonacademy.org, or call us at 207-647-3322 ext. 1213.